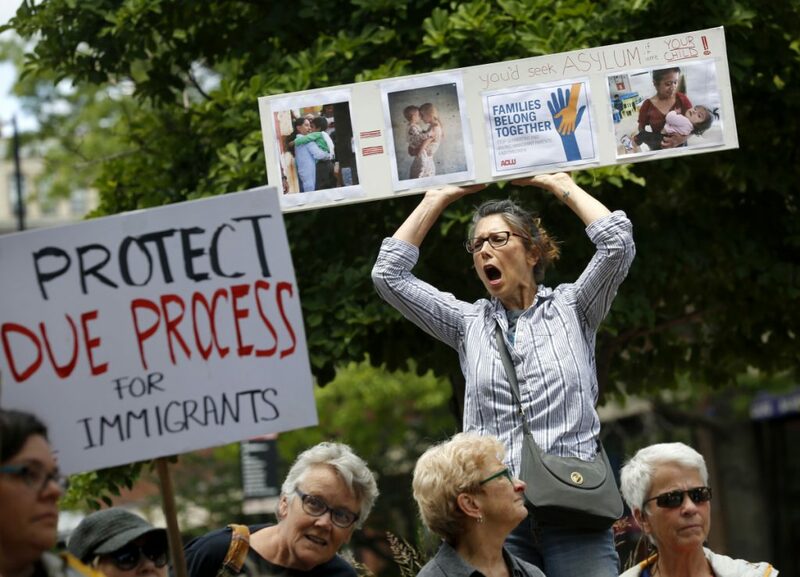 A Facebook call to rally in Portland draws more than 200 people eager to take a stand against White House actions at the border that have sparked outrage across the country. Zack Rouda has held plenty of one-person protests, so when he created a Facebook event last week about a rally Monday in Portland, his expectations were low. 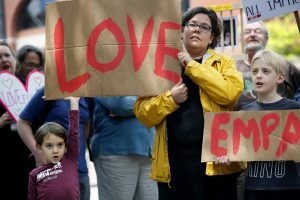 Leah Deragon of Portland holds signs that read LOVE and EMPATHY with her children Greta, 5, and Kjeld, 9. 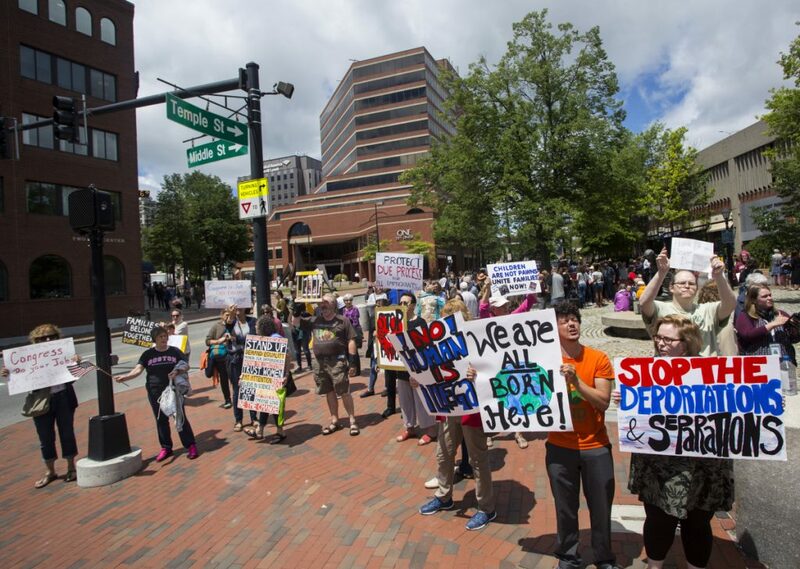 By noon, though, more than 200 people had joined him at the corner of Temple and Middle streets, often called Lobsterman’s Park, to protest U.S. immigration policies that have sparked growing outrage across the country. Monday’s protest didn’t feature any speakers or organized demonstration. There was some chanting and a host of signs, some reading “Silence = complicity,” “Keep Families Together” and “Stop Taking Migrants.” But mostly, those who attended said they came because they simply could not continue to be silent. Patty Morris held a sign that showed two pictures, one of a brown-skinned mother and child. The other showed a white mother and child. In the middle was an equal sign. Morris, who lives in Cape Elizabeth, said her ancestors came from Ireland and left their country because of widespread famine. Today’s situation is not different, she said, except for one thing. “They aren’t white,” Morris said. Although Trump signed an executive order ending the family separation policy – even after saying for days that only Congress could fix the problem – he has maintained an incendiary tone toward immigration. On Sunday, he even suggested getting rid of due process. Ana Courtney attended Monday’s protest with her 20-month-old twins. She said the stories and images of families being torn apart have been heartbreaking. Many used signs to state their opposition to the Trump administration’s immigration policies during the Portland protest at Lobsterman’s Park. A protest Saturday in Washington will include satellite events across the nation, including in Portland. The location of Monday’s protest was across the street from the Portland office of U.S. Sen. Susan Collins of Maine, a Republican who has been critical of some of the Trump administration’s immigration tactics, including the family separation policy that was halted last week amid increasing complaints. Collins has nevertheless been the target of protests from some who don’t believe she has done enough to push back against the president’s policies. “I’d like to see her make a commitment to do whatever she can to reunite families and also to oppose indefinite incarceration,” Rouda said. 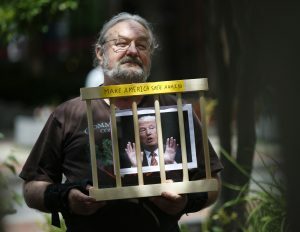 Mike Luce of Portland makes his opinion known with a 3-D display. Trump has called on Congress to pass an immigration bill, but Republicans and Democrats have not yet found anything near consensus on the issue. That was true during the Obama administration as well. Morris agreed that immigration has long been a difficult topic, but said the Trump administration’s attempt to “criminalize asylum seeking” amounts to a human rights violation. “I don’t think we realize how privileged and lucky we are,” she said. Monday’s protest was the latest in an escalating series of events around the country. A national protest in Washington, D.C., has been set for Saturday, with satellite events held across the country, including in Portland.